Back to back League games albeit at the Yakubu Gowon Stadium have cushioned the effect of the midweek disappointment and although our fate looks sealed in the Continent, we look well on track in the League. Six points off Wikki Tourists with two outstanding games. Prior to the game, I couldn’t get myself to do a match preview. Let’s say the events of the recent past starting from Wednesday’s defeat to the backlash from the players and the fact that some others were suspended from camp having broken camp rules, I felt maybe it’s just wise to engage my energies in other ventures that can guarantee peace of mind. The line-up was fairly predictable, the major changes in attack where Stephen Chukwude and Abu Azeez led the line. Andrew came in at the right flank and Ifeanyi Onuigbo was dropped to the bench. You should think Onuigbo’s is ideal following the mid-week exertions. Dare Ojo was plucked from RB and deployed in the middle where his energy, neat tackling and goal threat could come to more effective use. The game picked up after the interval, a thought the gaffer touched in his post match interview. Nzube was at the end of Osadiaye’s Freekick, nodding home our first. I didn’t see the game, we will await the highlights but a player of Nzube’s ‘physical build’ scoring against your team via a header, your defence must be pretty much in need of extra hours in the sun rehearsing their defensive drills this week. A second arrived afterwards from Ezekiel Bassey who despite the bright start he had for us last season, has had to endure a torrid one this year. His slump started at the CHAN tournament where he couldn’t reproduce his last season’s sparks. In recent times however he looks nearing his best once more. Long may that continue. Onuigbo had a run in from the bench late in the 2nd half and I think his energy could come in handy against tiring opposition. 2-0 against an opponent that took us to the cleaners earlier this season, you have had your revenge. Incidentally we play them again in the next few days for a place in the next round of the Federations Cup. That’s talk for another day though. “We won the game, that’s the most important thing. But if you look at the game, the first half was a bit shaky but if you look at the team, coming from the Continental game, we had to make a lot of changes. This team has not played together before but due to some injuries from the Continent and some people being tired from that game, we had to make a lot of changes. So it took us the first half to get organized, the second half was much better. “Yea, even if you sign 35, you can’t come back and change 11 players. In any team in the world you’ll see it’s mostly the same players who play most of the games. Whether you sign 35 players or not, you can’t sign 35 in the Continent also, so when you come back and try to change an entire team, even just changing four or five players, you saw the difference today in the first half. Traveling in Africa is different from in Europe, it’s not easy”. Which Competition is priority right now? “With all of them, whichever one you’re playing that time, you want to do well. Every competition you’re playing you want to do well, so me personally I won’t prioritize anyone but the League is quite important”. The gaffer has spoken. That should be that for today. Next postTrouble looms. Our season could be in jeopardy. I saw the game. The first half was boring. 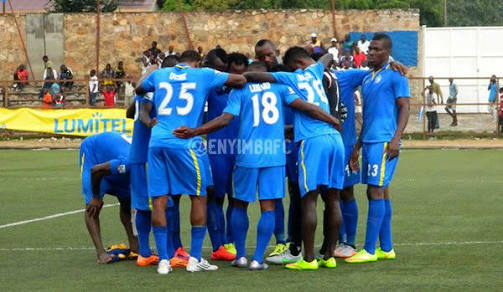 Enyimba started the second with more ambition and got the goals. Nzube was the most involved player yesterday IMO. I hope they replicate the result in Abuja this midweek FedCup rescheduled fixture. I hope so too. Thing is, we have some decent quality in the side, I’m glad we have a good pitch where player input can equate the result to some respect.